Revenue in the Tobacco Products market amounts to US$790,799m in 2019. The market is expected to grow annually by 2.1% (CAGR 2019-2023). In global comparison, most revenue is generated in China (US$231,621m in 2019). In relation to total population figures, per person revenues of US$107.44 are generated in 2019. The market for Tobacco Products is constituted here by (filtered) Cigarettes, Smoking Tobacco (fine-cut tobacco, pipe tobacco) and Cigars and cigarillos. Snuff and chewing tobacco as well as e-cigarettes and e-liquids are not included at the moment nor are untaxed tobacco products. All prices and market value statements include all relevant sales and consumption taxes. To enable a better comparison between Cigarettes and Cigars and loose tobacco in terms of per capita consumption and price per unit, the latter's volume is denoted in 1.000 kgs (total consumption) and grams (per capita consumption, price per unit). Due to a growing health consciousness of consumers and increased regulation (such as through advertising bans in Europe) the use of tobacco in Europe has been decreasing in recent years and volume growth has almost exclusively been realized in emerging markets. The five most important producers worldwide are the China National Tobacco Corporation, Philip Morris International (PMI), British American Tobacco (BAT), Japan Tobacco International (JTI) and Imperial Tobacco. Reading Support Revenue in the Tobacco Products market amounts to US$790,799m in 2019. 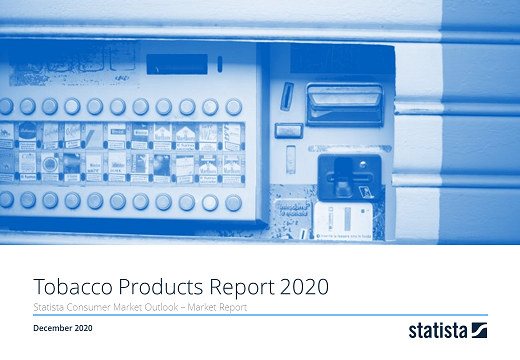 Reading Support The Tobacco Products market is expected to show a revenue growth of 2.3% in 2020. Reading Support The average revenue per person in the market for Tobacco Products amounts to US$107.44 in 2019. Reading Support In the Tobacco Products market, volume for cigarettes and cigars is measured in sticks whereas smoking tobacco is measured in tons. One gram of loose tobacco is the rough equivalent of the tobacco content of a typical rolled cigarette. Reading Support In the Tobacco Products market, volume for cigarettes and cigars is measured in sticks whereas smoking tobacco is measured in tons. One gram of loose tobacco is the rough equivalent of the tobacco content of a typical rolled cigarette. Reading Support In the Tobacco Products market, per-capita consumption of cigarettes and cigars is measured in sticks whereas smoking tobacco is measured in grams. Reading Support In the Tobacco Products market the price per unit for cigarettes and cigars refers to the average price per stick and for smoking tobacco to the average price per gram. Reading Support With a market volume of US$231,621m in 2019, most revenue is generated in China. Here you can find more studies and statistics about "Tobacco Products".